Aiseesoft iPad 2 Video Converter for Mac is powerful and professional Mac iPad 2 Movie Converter for Mac users convert most popular video files to iPad 2 compatible video and audio formats with amazing speed and best output quality. Besides, this iPad 2 Video Converter for Mac is also an iPad 2 Video Editor. With it, users can conveniently customize output video effect. For example, you can trim video length, crop video aspect ratio. ...... etc. This Mac iPad 2 Video Converter possesses an intuitive interface, which can bring you the best user experience. With this iPad 2 Video Converter for Mac, users can conveniently convert most popular video files to iPad 2 video and audio files. 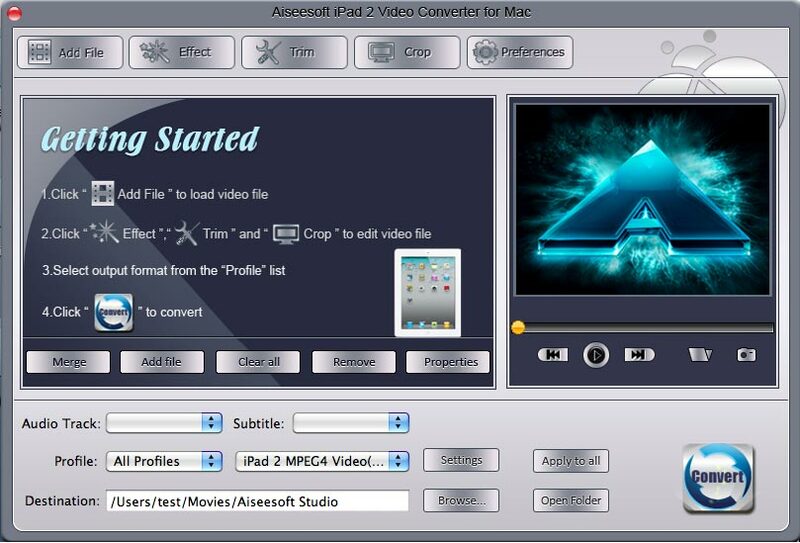 Aiseesoft Mac iPad 2 Video Converter allows users to input the same source video file repeatedly and set different formats for each. Then after one conversion, users can get different formats simultaneously. Users can trim any video segment by settings the start and end time. Also users can merge different video clips together. Qweas is providing links to Aiseesoft iPad 2 Video Converter for Mac 3.0.12 as a courtesy, and makes no representations regarding Aiseesoft iPad 2 Video Converter for Mac or any other applications or any information related thereto. Any questions, complaints or claims regarding this application Aiseesoft iPad 2 Video Converter for Mac 3.0.12 must be directed to the appropriate software vendor. You may click the publisher link of Aiseesoft iPad 2 Video Converter for Mac on the top of this page to get more details about the vendor.